This weekend, the beacons of the Es’hail 2 narrowband transponder have undergone maintenance. The beacons have been off for several periods of a few hours on Friday and Saturday. After the maintenance, there are two main changes: the phase noise of the beacons has been fixed, and the beacons are now approximately 3dB stronger. 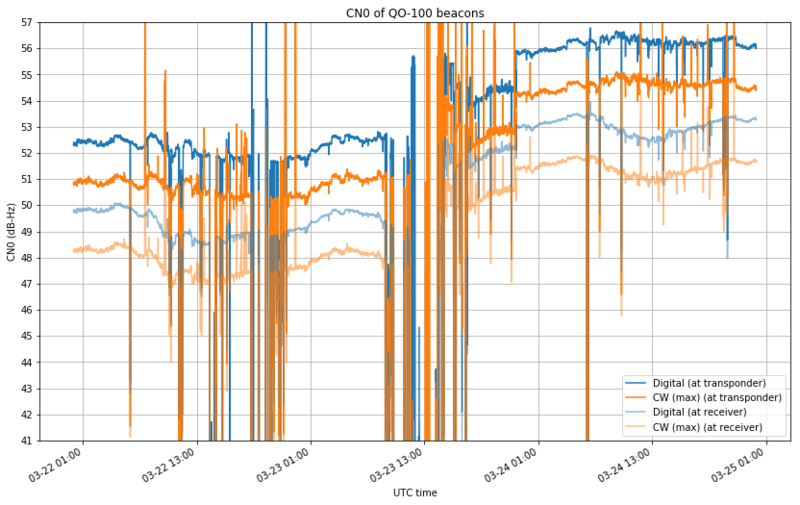 Since the opening of the transponder on February 14, some phase noise on the two beacon signals was appreciable slightly above the noise floor, and with the latest increase in power of the beacons, the phase noise was more evident. Now the problem is fixed and the transponder is clear of phase noise. 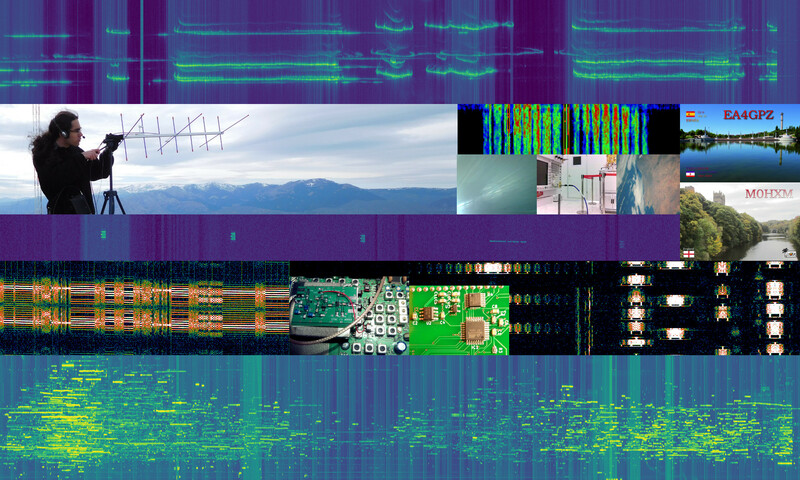 The figure below shows the power of the beacons and transponder noise (measured in 2kHz bandwidth). 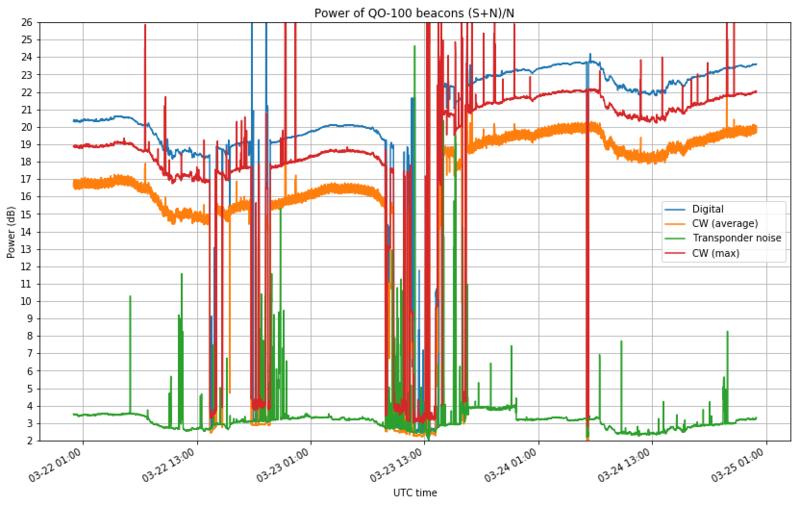 You can see that the beacon power has daily fluctuations of up to 2dB, but despite of this fact it is clear that the beacons are now approximately 3dB stronger than before (maybe even 4dB). The figure below shows the CN0 of the beacons, measured both at the transponder and at my receiver (where it is lower due to system noise). The CN0 is now extremely high: 56dB for the BPSK beacon. In a previous post I thought about what could be done with 45dB of CN0. The conclusion was that if you want to fit a digital signal in an SSB channel bandwidth, you are much more bandwidth-limited than SNR-limited. This is now even more true. With the increased beacon power, it should be fairly easy to decode the beacons with a bare LNB, even despite the fact that the transponder gain has been reduced twice. Also, now that the SNR of the beacons is so high, there is no excuse for being louder than the beacon. Anyone who is stronger than the beacon is most likely using too much power. Their mode of choice probably works equally well with several dB less of SNR.